Please allow for at least 15 minutes before our closing times for collections / repairs / adjustments. There is usually room for patients to park in Heath Avenue – immediately next to the practice – or across the road behind the petrol station. Most wheelchair users have no difficulty accessing our practice. 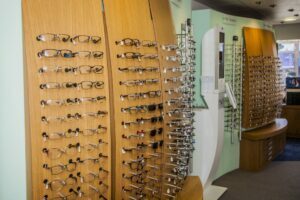 If you are able to transfer from your wheelchair into our consulting room chair the eye examination will be simpler and more accurate than if we examine your eyes while you remain in your own chair.